Many of my readers have send me messages asking more about what products they can use for their acne. I mentioned in an earlier post how yogurt can be used as a cleanser to clear up the face. 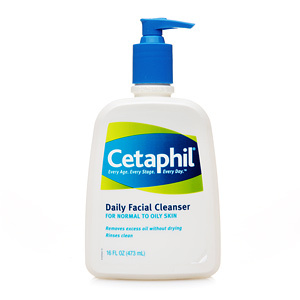 One major acne fighting product that is on the market right now is Cetaphil Daily Facial Cleanser. A lot of celebrities have used Cetaphil as their secret weapon to get rid of acne. What's so great about this product is that it works and it is a drugstore brand! It sells for about $7 to $8 dollars, which is an amazing price compared to other acne products. The results are amazing as well. Within the first week of using Cetaphil, many people being to see a change in their skin. The redness beings to clear up and acne beings to fad out. Cetaphil does sell other skin products as well. I did find Cetaphil Moisturizing Lotion at Boots Pharamacy in Alwahda Mall but didn't find the daily facial cleanser. Hope this had been helpful for all who are looking for that miracle acne cure. Have you ever used Cetaphil for acne? Let us know what your results are! Thank you, I needed a way to get rid of my acne. Thanks for posting your tips. I'm glad that it helped you habeebti!